Measuring the time of the commencement of the contest at the precise prearranged interval of the multiple worlds (during the Synchronizing Events). I bring leadership, direction and focus to our mission. 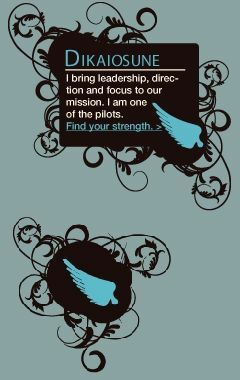 I am one of the pilots. The original six travelers wrote a truly epic story. We've found almost all of it, so I think it's time to start figuring out what matters most. We need to boil down the epic story the original six travelers wrote to a "must know" document. What are the Top 10 Things we've learned from the Lost Ring Codex so far? Let's work together on this mission on the forums. Post your suggestions for the list, or make your own complete list. When we've collectively got our favorite top 10 list, I'll blog it. I think Sofia (the knowledge seekers) and Dikaiosune (the list makers, among other things!) would be especially helpful for this mission, but really EVERYONE's POV would be good to have for our top 10 so we make sure we don't miss anything vital. Dikaiosune, the Codex names YOU as the leaders of our Lost Sport training events! We don't know anyone who is actually good at this sport yet -- at least, not in this world. So ANYONE could turn out to be the world's best. We need to get as many people playing as possible to discover our own lost game champions! There are lost Olympic champions out there just waiting to be discovered... champion runners, and champion walls! We've got our upcoming group for Labyrinth Training Events. But there are lots of different ways to organize and promote training events. Share your best ideas with each other, and remember: every training session, no matter how small, is important! Dikaiosune, your strength can help prepare us for the important missions ahead. Are we the new secret "game keepers" for the Summer 2008 Olympics? If so, then we need to how many of us there are, what are each of our ancient strengths, and where in the world we are. Can you help track our members, and broadcast everyone's strengths and locations? Use our discussion forums, or any other tool you want! This page was last modified 22:03, 21 July 2008.